Blurring an image using digital editing can be a good way to make it look more interesting or mysterious, hiding possible imperfections or focusing more on colors rather than shapes and shadows. This photo editing technique is also used frequently by photographers to correct images that look too sharp, adding a most welcome smoothing effect that facilitates a more natural blending of all elements present in the image. Pictures with an added blur effect often suggest a motion movement and can create a feeling of authenticity in capturing a particular moment on camera. With reaConverter, blurring one or more images can be done in only a few seconds, using three different blurring techniques with customized intensity. Open the images you intend to edit using the software's drag-and-drop feature or pick them one by one from a location on your computer. You can also add entire folders or load images from text files. Here you will be able to select the type of blurring effect you intend to apply on your images. The available options include Split blur and Gaussian blur, and each can be applied with customized intensity using the handy scroll bar placed below. The real time effect of your selection is visible in the right side of the window when you click the Preview button. In the Saving options tab, decide on the location of your edited images. 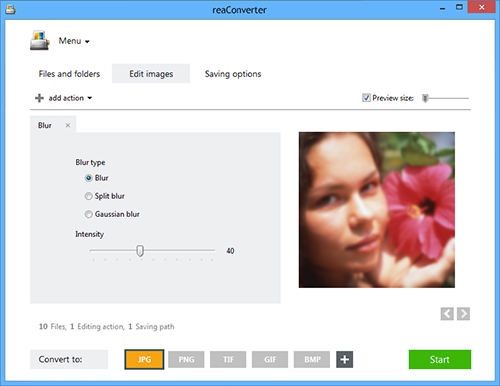 reaConverter allows you to save both locally and online. 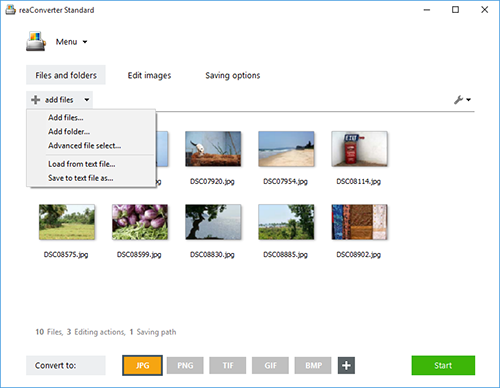 In the former case, you can choose between saving directly in the source folder or in a customized one. In the latter, you can use your Dropbox, Google Drive, Box.net or SkyDrive account. Before completing the editing process, don't forget this powerful software also supports conversion in and from an impressive number of image file formats. 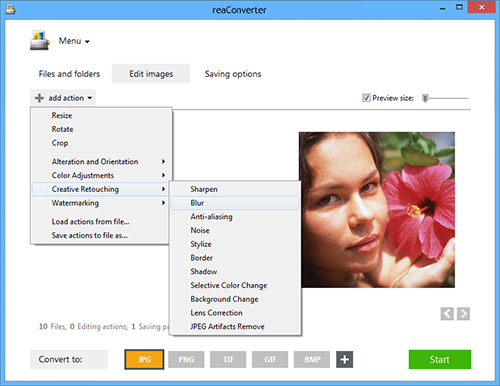 Simply click on one of buttons placed in the bottom of the window in order to change the extension of your images. Than press Start and enjoy your new files in a few moments! Command-line blurring tool is an advanced feature meant for professional use, and is available in Pro edition only.